The release of Fast video cataloger 5 is getting closer and today I want to share one of our more frequently requested feature. 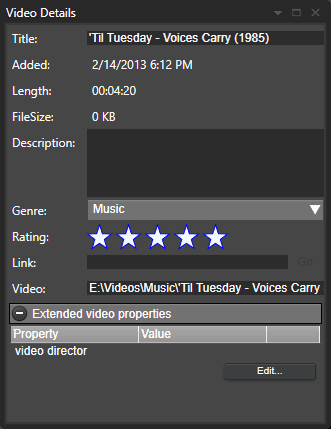 One that we have added to the next release of program, extended video properties. But first a lile detour. From time to time people request that we add new video genres to the program. I always tell them to skip genres and instead use the keyword function instead. Keywords is way more powerful and flexible and there is really no reason to use the genre. We have added editable genres. Just right click on them in the video details window. Even if you can now change the genres I still hold to my old advice to prefer keywords. But, we have also added something even more powerful to Fast Video Cataloger 5. You will be able to edit your own user video properties. We understand that there are people and companies that use the program for things we have not even considered. So we have made it possible for you to define your own video properties. On the video details window there is now a new section with “Extended video properties” for your catalog. Click the edit button to add your own custom properties to your catalog. If people use this I am sure we are going to extend this feature even more in the future based on your and others feedback. To go with this new feature we have also extended the search function. There is a new search block for extended video properties that can be combined with other search criterias. Please give it a try and let us know if this is helpful or if there is something we could do to make this even more useful. Is it possible to apply multiple values to a property? If so what is the delimiter? I assume this is a question about the extended video properties? No its not really possilbe. The extended properties as one single string. I you are doing a scripting solution around extended properties it is possible to allow any delimiter for an extended video property you use in your custom solution.